Let's stay over the Hokkaido Garden Highway! Special plan exclusively for garden fans proposed by Hokkaido Garden Highway Official Hotel. 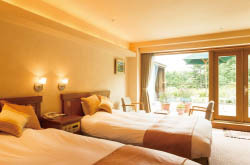 Enjoy the unique plans of each hotel such as the room surrounded by the scenery from the window and floral patterns. We have prepared a rose room and a herbal room 2 type that you can enjoy with the senses that you can feel even in the color, scent, texture, sound, wind when you visit the garden. (Supervised by Ueno Farm Ueno Sand Yuki) ◎ Photo / Herb room healing, Furano hot spring "Purple Aso no Yu" bathing ticket. Convenient for the relay point of the Garden Highway leading from Asahikawa, Furano to Obihiro. Surrounded by woods, it is a space of healing palm wrapped in comfort like a hideout. We also have a small present only for the garden room. Garden chair and umbrellas are available on the large terrace, and the scent of aroma drifting inside the room creates a more relaxing space. Guests can spend a relaxing time enjoying a colorful garden spreading in front of you. Toyosujite guest room which can see the majestic view unique to the inn built at the bank of the Tokachi River. 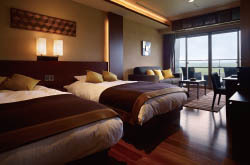 All rooms are Hokkaido heritage's "Mall Hot Springs" room with an open-air bath. Please spend your time with a rich natural scenery.